My new blog feature is the Pro Tip Blog which looks at specific areas of the game and combines my own brief thoughts with a tip which I seek out from an experienced international player. 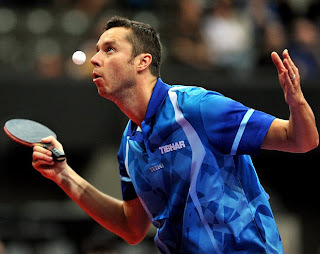 My first blog in this segment is on Angle Play and features a thought from, in my opinion, the master of angle plays, former World Number 1; Vladimir Samsonov. 'The top players are always trying to find a weak spot. However, if you continuously play to the same place your opponent will get used to it. In the game the tactics are changing (or should change) all the time. Using the angle is extremely useful against players with a weak backhand or players who try to play every ball with their forehand. We should not forget that playing deeply to the sides of the table is quite a risk even for the best players and you may make more unforced errors than usual.' Vladimir Samsonov. Many thanks to Vladi for contributing to the first post in this new feature, please do give feedback on whether you like this idea and found it useful! The recent Shakehand vs. Penhold competition brought to light the decline of popularity in a formally traditional style of the game. Penhold was highly popular in Asia, styles which became frequently used especially in Korea and China. Nowadays the penhold style is not as common, particularly among the young generations of players. 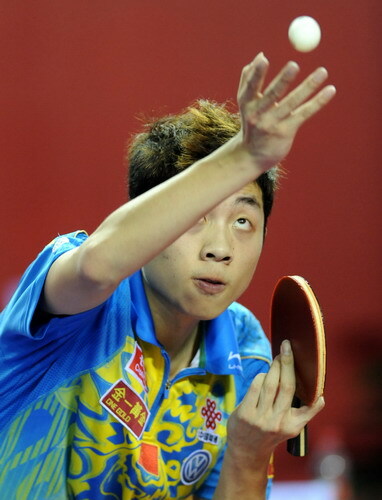 Yes we have the likes of Xu Xin and Lee Jungwoo in this middle generation, but looking to Yan An, Fan Zhendong and beyond the art of penhold is certainly becoming less popular. So are the days of this style numbered? I think there will always be a place for penhold in table tennis as long as players have idols like Ma Lin, Wang Hao, Liu Guoliang and others like Ryu Seung Min and Yoshida Kai. In terms of competition worldwide the decrease is evident already. Most of the focus lays on the men's game, but if you observe women's table tennis you find that the number of penhold players have diminished rapidly and shakehand is by far the predominant grip. Much like shakehand, the penhold game has developed over the decades to cover weaknesses, the reverse pengrip backhand was introduced to reduce the need for a forehand dominant game and intense footwork and also to reduce the limitations of a weak crossover. But perhaps this was the strength of penhold, perhaps the ability to play forehand everywhere is what made Ma Lin and Ryu Seung Min such formidable opponents in their prime, Ma Lin's forehand was renowned and the control they both had on their backhand was unparalleled almost. Who knows. It certainly fits a more traditional game of backhand control, forehand attack. I'd love some more thoughts, please do comment and include your ideas. Do you like shakehand more or penhold? Do you think penhold is in decline? As most of you will know I was lucky enough to have the opportunity to head to the Werner Schlager Academy in Schwechat, Austria for the World Hopes Week training camp and competition. I was present as the coach for New Zealand which had qualified two players through Oceania (Yang Lun Zhao and Hui-Ling Vong). This is my chance to share more about how the week went from a more personal point of view, how one week can make such a big impact on a player/coach. 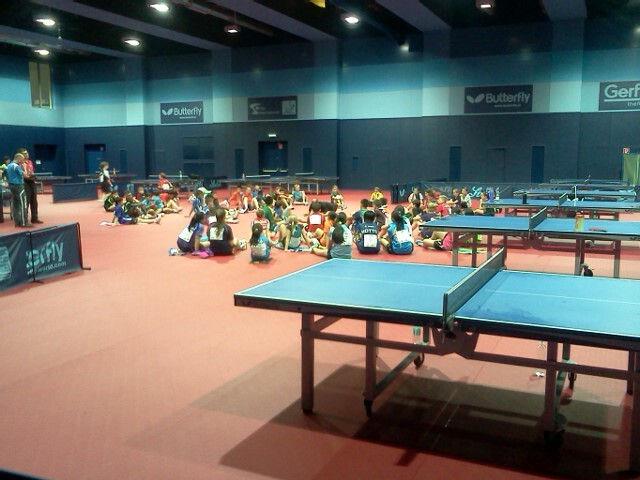 The Werner Schlager Academy is an amazing venue and despite having an ITTF Hotspot centre with 20 tables in Auckland where I live, I was still blown away with the sheer professional setup of the academy. Pair this 25 table, air conditioned training palace with it's perfectly sprung red floors, with a staff of amazing coaches the likes of Richard Prause, Dirk Wagner, Mario Amizic, Tamara Boros, Aya Umemura, Mikael Habesohn, Dmitry Levenko and Provas Mondal accompanied by the direction of the man himself Werner Schlager, the Chinese experience of Li Xiaodong along with ITTF Coach Jarek Kolodziejczyk and Development Director Mikael Andersson and his dedicated crew. The training camp ran for 4 days, there was a lot to be learned on my part, not merely by observation but on being able to weave among the tables in the playing area to watch the players (particularly my own) and at times interact with the coaches to get feedback. Also the ITTF had organised workshops for the coaches which covered a wide range of topics, all very interesting and a big part of the overall experience of the trip. Of course all the seminars were great, particularly enjoyed Schlager's and Kolodziejczyck's. On the second day I had a unique opportunity. Each coach had the chance to be 'paired' with a coach in order to observe their coaching analysis and approach with the kids. 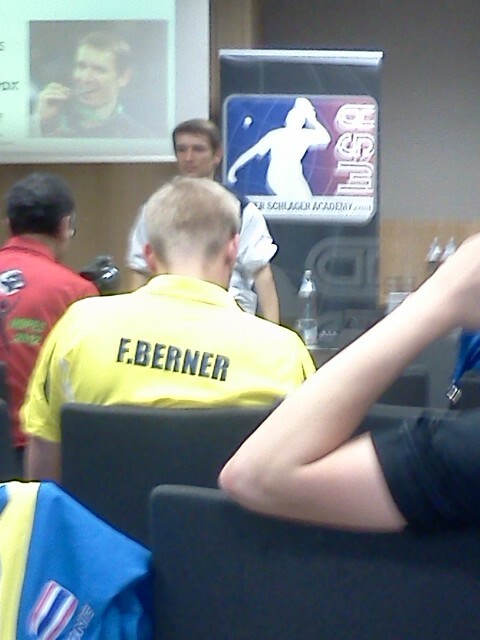 By chance I was standing with Werner once the morning session had begun, just having a chat. Richard Prause walked up and I took the chance to remind him who I was and that I had interviewed him last year. Richard was kind enough to respond by telling my to stick to Werner for the next hour, ask him any questions I wanted and use the chance to learn as much as I could. Having this opportunity to see the analysing power of a world champion and leading coach, along with the attention to small details and mechanics was an opportunity I will not soon forget. Werner then went on to do a service demonstration for the kids which was good fun and I took the chance to get some photos during that. What you should know above all is that during this week, although it was my first time meeting Werner in person, he was truly humble and approachable. I had another unique opportunity later during the training camp, Li Xiaodong is one of China's most reputable coaches and he did a multiball demonstration. Little did I know that the list I had added my name to earlier entitled Li Xiaodong Multiball was not in fact an opportunity for one of my players to have a session with him, but actually me feeding a multiball session for the kids while the Chinese coach looked on and gave feedback on my performance. I was one of 12 coaches lucky to have this experience. Up close and personal, Li Xiaodong demonstrates to show me a detail he outlines. 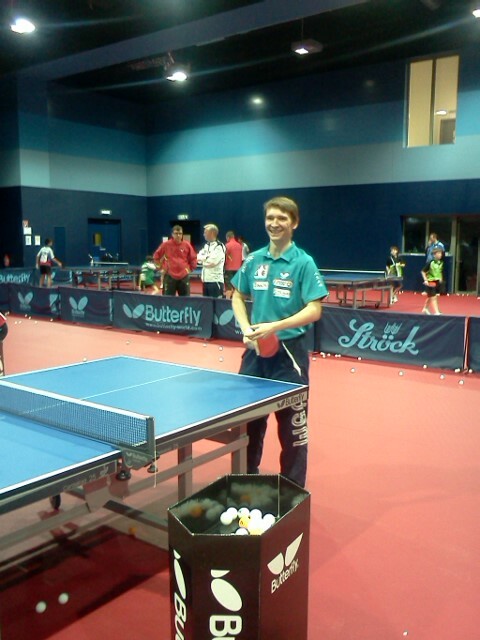 It was a superb opportunity for any coach to get feedback from such a figure in table tennis. I think one of the things that really stood out among anything was the passion from the kids. These kids all have talent, they all work hard and have the makings of great players in the future. It was such an honour for me to be present to see them now and to have the chance perhaps in 5-10 years time to see if any of them rise through the ranks and do become top players. 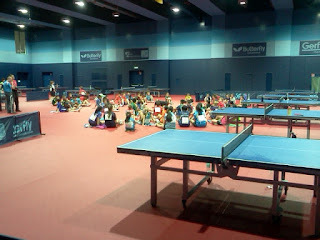 I think ITTF Hopes Week is the future of table tennis, it is a well organised event and brings the focus to the future players in our sport, getting the talent early and giving those players an eye opener. For me it was seeing the Academy and the approach of the coaches which really impressed me and solidified in my mind that if I want to achieve my goals then I need to set the wheels in motion and finalise my own plans to play in Europe and it has to be done soon. 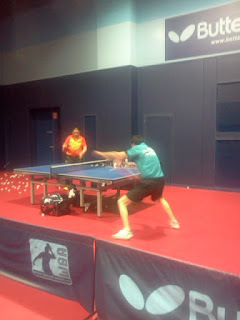 On that note, I was lucky enough to catch Stefan Fegerl, ranked 79 in the world, having a training session with Li Xiaodong. It was nice to meet them both, very creative guys, very down to earth and by the sound of it Piing of Power has a lot more coming in the near future. They also of course made this video for the ITTF below! After competition concluded I had the chance to visit Vienna City. My players had both performed very well, both making the main draw for the teams and singles. Yang Lun made the quarterfinals in the boys draw which was an exceptional result for New Zealand. It gave me a lot of satisfaction to have these results, after 4 days of training for them both to still have it in them to play hard at the tournament just goes to show that sometimes it's the kids in our sport who demonstrate the highest level of commitment. So that basically sums up my trip. Despite being one of the best experiences I have ever had, it is still nice to be home. In saying this, my own aspirations and passion for table tennis have grown yet again and I look forward to taking some time in the coming weeks to make some more decisions about where I want to be with the sport in the coming years. Hope you enjoyed my personal summary of the week!